How and Why Did You Create this Booklist? I created this page because I’ve gotten so many questions about whether or not various books were based on specific myths, requests for “books like X,” and inquiries about modern retellings of Celtic myth. This is not a complete list of Celtic-inspired SF and fantasy; it is very far from such a list. These are books that I’ve read and liked, an arbitrary and idiosyncratic selection of books that are either directly inspired by particular bits of Celtic myth and folklore, or that, while original, draw on Celtic traditions, myths, and lore. Many of these books are marketed as juvenile or “young adult” novels, but don’t let that stop you from enjoying them. Sullivan, William III. Welsh Celtic Myth in Modern Fantasy (Contributions to the Study of Science Fiction and Fantasy, No 35) . Greenwood: New York, 1989. ISBN 0313249989. I am by no means the first to notice that Celtic myth and folklore are fertile grounds for inspiring writers of fantasy and science-fiction. William Sullivan III, a member of the English department faculty at East Carolina College, in addition to editing an excellent collection of essays on the mabinogi , has published an interesting study of Welsh myth used in contemporary fantasy (Contributions to the Study of Science Fiction and Fantasy, No 35). You might also want to read his essay on “The Influence of the Mabinogi on Modern Fantasy Literature” published in Celtic Cultural Studies and available here. Alexander, Lloyd. The Prydain Chronicles ( The Book of Three . Yearling Books, 1978. ISBN 0440407028. The Black Cauldron . Yearling Books, 1980. ISBN 0440406498. The Castle of Llyr . Yearling Books, 1974. ISBN 0440411254. Taran Wanderer . Yearling Books, 1969. ISBN 0440484839. The High King . Yearling Books, 1969. ISBN 0440435749. Lloyd Alexander’s The Prydain Chronicles are partially responsible for my interest in Celtic languages and myths. I first read them when I was about nine, and loved them. Alexander draws on the medieval Welsh tales in the Mabinogi and the Welsh triads, but really uses them more for names and inspiration than direct plot. The Chronicles of Prydain involve an assistant pig keeper who longs to be a hero, a wizard with strikingly druidic tendencies, an enchantress, warriors, a cauldron that brings the dead to mute life, a prophetic talking pig, all of which are in the best Welsh tradition, a quest, and a struggle between good and evil. In 2015, Henry Holt published a special 50th anniversary edition of all the books; they have extra materials (including things like additional short stories, pronunciation guides, etc.) so I’m linking to them, though I am nostalgically fond of the previous editions covers. These are the individual books, listed in sequence. Lloyd Alexander. The Book of Three . This anniversary edition includes bonus materials; an interview with Lloyd Alexander, a Prydain short story, the first chapter of the next Prydain book ( The Black Cauldron , a Newbery Honor book), an author’s note, and a pronunciation guide. Since The Book of Three was first published in 1964, young readers have been enthralled by the adventures of Taran the Assistant Pig-Keeper and his quest to become a hero. Taran is joined by an engaging cast of characters that includes Eilonwy, the strong-willed and sharp-tongued princess; Fflewddur Fflam, the hyperbole-prone bard; the ever-faithful Gurgi; and the curmudgeonly Doli — all of whom have become involved in an epic struggle between good and evil that shapes the fate of the legendary land of Prydain. Lloyd Alexander. The Black Cauldron . In the land of Prydain, evil is never far away. Arawn, Lord of the Land of Death, has been building an army of dark warriors to take over Prydain, and the only way to stop him is to destroy the Black Cauldron he uses to create his dreaded soldiers. Taran the Assistant Pig-Keeper and his loyal companions must journey deep into Arawn’s domain to destroy the Black Cauldron. For each of them, the quest has a special meaning. For Taran, it is the glorious opportunity to use his first sword in battle. But war requires a sacrifice greater than he’d ever imagined. . . .
Lloyd Alexander. The Castle of Llyr . Princess Eilonwy hates to leave her friend Taran, Assistant Pig-Keeper, and her beloved home, Caer Dallben. Why does she have to go to the Isle of Mona to train as a proper lady when she’s already a princess? But Eilonwy soon faces much more than the ordeal of becoming a dignified young maiden, for she possesses magical powers sought by the evil enchantress Queen Achren. Lloyd Alexander. Taran Wanderer . Lloyd Alexander. The High King . The companions’ last and greatest quest is also their most perilous. The biting cold of winter is upon them, adding to the danger they already face. Their journey, fraught with battle and bloodshed, ends at the very portal of Arawn’s stronghold. There, Taran is faced with the most crucial decision of his life. In this breathtaking Newbery Medal-winning conclusion to The Chronicles of Prydain , the faithful friends face the ultimate war between good and evil. A companion book to The Chronicles of Prydain, this collection of short stories revisits beloved characters and reveals more about the history of the magical land of Prydain. Here, readers will find Dallben, destined to be an enchanter; Angharad, a princess of the House of Llyr; Kadwyr, the rascal crow; and Medwyn, the mystical protector of all animals. They’ll learn the grim history of the sword of Dyrnwyn and even find out how Fflewddur Fflam came by his enchanted harp. How did Coll rescue Hen Wen when she disappeared at the hand of Arawn, Lord of the Land of Death? Find the answer to this question and many more, in The Foundling: And Other Tales of Prydain by Lloyd Alexander. Tunnell, Michael O. The Prydain Companion: A Reference Guide to Lloyd Alexander’s Prydain Chronicles . New York: Henry Holt & Company, Inc.; April 2003). ISBN: 0805072713. This is an encyclopedic guide to all things Prydain. Terri Windling was the original architect of this shared universe about a community of elves, humans, and halflings living on the border between the mundane human world, and a portal to the elvish otherworld. One Borderland writer describes it as “where Magic meets Rock & Roll.” Windling’s own introduction to the Borderlands is a good place to start exploring. Although a number of well known and talented writers have played in the Borderlands, I tend to favor Bull’s and Shetterly’s contributions over those of their fellows. I also heartily recommend Shetterly and Bull’s own non-Borderlands books. Bull, Emma. Finder: A Novel of the Borderlands. Tor: New York, 1997; repr. July, 2003. ISBN 0765347776. Finder is a Borderlands detective novel. The Finder is a mortal named Orient whose fey ability to find the lost, whether animate or inanimate, involves him in a Borderlands police investigation of a murder and a mysterious drug that mortals believe will render them fey. Finder is just one of the novels and short story collections set in the shared universe of the Borderlands. 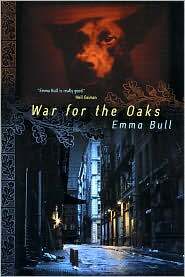 Here’s an online Emma Bull bio and bibliography. Shetterly, Will. Elsewhere. New York: Tor, 1991. ISBN 0812520033. Ron, a teenage runaway, comes to Bordertown in search of something, and finds lots of things, including questions, friends, and maybe, a few answers. Just read it, OK? It’s good. Shetterly, Will. Never Never . New York: Tor, 1993. ISBN 0812551516. This is, strictly speaking, the sequel to Elsewhere , but it’s also a stand alone novel. Shetterly has managed to capture the voice, and the feelings, of a seventeen year old without being maudlin or condescending. That’s not an easy task for any writer, and it can’t be any easier when your hero is a werewolf. This is one of those books that publishers categorize as “young adult” novels, which sometimes means they are perceived as juveniles. This is a book for intelligent adults, of any age. It’s not kid lit. I think I may like it better than Elsewhere , but to tell the truth, I think of them as a single novel the publisher split, even though I’m pretty sure that’s not the case. Here’s a Will Shetterly web page. Bull, Emma. War for the Oaks. Ace: New York, 1987. Repr. Tor: New York, 2001. ISBN 0765300346. This independent novel, long out of print, was recently reprinted. It’s about an otherworld intruder, a pooka who shape-shifts into a large black dog, and Eddi McCandry, a mortal musician who becomes an unwilling pawn in a fairy civil war, is extremely well done. Bull draws on fairy folklore throughout her novel, but uses it to create fully realized characters. Bull’s work is often cited as an example of “urban fantasy,” but she makes Minneapolis as full of wonder as Tir nan Og. This is one of the books that you really should read. Don’t pass by Bull’s SF either; Bone Dance and Falcon are both exquisite, and there’s even a tangential connection to things Celtic in Falcon, since much of the nomenclature is Welsh. Cherryh, C. J. The Dreaming Tree. DAW: New York, 1997. ISBN 0886777828. This fantasy novel was originally published as two books, The Dreamstone and The Tree of Swords and Jewels . And earlier still, the book has its roots in a limited edition novella called Ealdwood . Cherryh, one of my very favorite authors, and the winner of numerous awards for her SF and Fantasy novels, uses Celtic folklore to create a universe where human and Sidhe live separate but entangled lives, in a connection that permanently affects both worlds. There’s an appendix in the back with a pronunciation guide for the Scottish Gaelic, Welsh and Anglo-Saxon names Cherryh uses, though she does tend to lump Gaelic under the rubric “Celtic.” There’s a well thought out Pooka here as well. Be sure to check C. J. Cherryh’sWebsite. Cherryh, C. J. Faery in Shadow. Del Rey, 1994. ISBN 0345372794. Cherryh’s Faery In Shadow is often described as “darker” than Cherryh’s other novels. It too revolves around the connections between the mortal and the other world, but involves a blood debt, a selchie, and a pooka, and two fey children in crisis. Cherryh, better than most, captures the “dark” aspects of the Celtic Otherworld, and their effects on people, mortal, Fey or halfling. Cooper, Susan. The Dark is Rising Sequence. (Boxed set) Aladdin Paperbacks, 1993. ISBN 0020425651. These books Over Sea, Under Stone , The Dark Is Rising , Greenwitch , The Grey King , and Silver on the Tree are loosely tied to the Arthurian mythos; one book features the return of Arthur’s son, and Merlin is a recurring figure. Cooper, inspired by Celtic settings in Cornwall and Wales, does an excellent job of drawing on local folklore and thoroughly integrating it into the plot. The Dark is Rising sequence were partially responsible for my life-long interest in things Welsh and Arthurian. Cooper’s The Dark is Rising sequence won the ALA Margaret A. Edwards award in 2012. Susan Cooper has a Website. These are the individual books of Susan Cooper’s The Dark Is Rising sequence, listed in order. Over Sea, Under Stone . On holiday in Cornwall, the three Drew children discover an ancient map in the attic of the house that they are staying in. They know immediately that it is special. It is even more than that— the key to finding a grail, a source of power to fight the forces of evil known as the Dark. And in searching for it themselves, the Drews put their very lives in peril. The Dark is Rising . Simon, Jane, and Barney, enlisted by their mysterious great-uncle, arrive in a small coastal town to recover a priceless golden grail stolen by the forces of evil — Dark. They are not at first aware of the strange powers of another boy brought to help, Will Stanton — nor of the sinister significance of the Greenwitch, an image of leaves and branches that for centuries has been cast into the sea for good luck in fishing and harvest. If I had to pick a favorite from The Dark Is Rising sequence, I think I’d pick Greenwitch . This is probably the most “Welsh” of the books, and the one I read first. There is a Welsh legend about a harp of gold, hidden within a certain hill, that will be found by a boy and a white dog with silver eyes — a dog that can see the wind. Will Stanton knew nothing of this when he came to Wales to recover from a severe illness. But when he met Bran, a strange boy who owned a white dog, he began to remember. For Will is the last-born of the Old Ones, immortals dedicated to saving the world from the forces of evil, the Dark. And it is Will’s task to wake-with the golden harp — the six who must be roused from their long slumber in the Welsh hills to prepare for the last battle between the Dark and the Light. Silver on the Tree . The Dark is rising in its last and greatest bid to control the world. And Will Stanton — last-born of the immortal Old Ones, dedicated to keeping the world free —must join forces with this ageless master Merriman and Bran, the Welsh boy whose destiny ties him to the Light. Drawn in with them are the three Drew children, who are mortal, but have their own vital part in the story. These six fight fear and death in the darkly brooding Welsh hills, in a quest through time and space that touches the most ancient myths of the British Isles, and that brings Susan Cooper’s masterful sequence of novels to a satisfying close. Macavoy, R. A. The Grey Horse . New York: Bantam, 1987. Reprint E-Reads. ISBN 1585860409. Another novel with a pooka, this time an Irish one in a love story that bridges the gap between the mortal and the fey almost effortlessly. It’s been out of print for years, but it’s been reprinted, and it’s also available as an E-book. McKillip, Patricia. The Forgotten Beasts of Eld. New York: Harcourt Brace, 1996. Reprint Magic Carpet Books. ISBN 0152008691. The Forgotten Beasts of Eld is a book that was initially marketed as a young adult fantasy, but like many such books, could quite easily be considered an adult novel. The heroine comes from a long line of wizards, with a gift for calling magical animals to her, a magnificent lion, a hawk, a talking prophetic pig, a dragon. In her search for the elusive , she discovers love, and finds herself summoned by another wizard collector. Though Beasts of Eld pre-dates the Riddlemaster of Hed trilogy, this book too refers to wizards and masters of lore in the form of riddles, and though it does not draw on any specific myth or tale, is rich with Celtic motifs that are brought to new life. McKillip, Patricia A. Riddle-Master . New York: Del Rey, 1989. A single volume containing The Riddle Master of Hed. ISBN 0345331044. The Heir of Sea and Fire. ISBN . Harpist in the Wind . ISBN 0345324404. These three books are tightly woven together, so it is best to read them in order, though it isn’t compulsory; each book stands well on its own. Unlike many Celtic inspired authors, McKillip doesn’t use a particular myth which she then fleshes out, nor does she “borrow” names. Incident and character are all her own, but the idea of lore contained in riddles, often voiced in triads, the presence of shape-changers, talking pigs, magical pig keepers, and the frequent references to stories associated with riddles, are all very reminiscent of Celtic mythology. McKillip’s Riddle-Master trilogy are some of the finest fantasy novels I have ever read; most people either love them or loathe them. I re-read them about once a year. The three books have finally been republished as a single volume, under the title Riddle-Master. New York: Ace Books, March 1999. ISBN: 0441005969. In the UK the combined version of the trilogy is also sold as The Riddle-Master’s Game. These are the individual books listed in order. The Riddle Master of Hed . The Heir of Sea and Fire . Harpist in the Wind . Stewart, Mary. The Crystal Cave . New York: Ballantine Books, 1992. Reprint Eos, 2003. ISBN 0060548258. The Hollow Hills. New York: Ballantine, 1996. Reprint Eos, 2003. ISBN 0060548266. The Last Enchantment. New York: Ballantine, 1996. Reprint EOs, 2003. ISBN 0060548274. The Wicked Day. New York: Ballantine, 1996. Reprint Eos, 2003. ISBN 0060548282. Stewart’s retelling of the Arthurian mythos, based mostly on Geoffrey of Monmouth, but also strongly influenced by Welsh traditions and historical research, is still by far my favorite. Aside from being well-done versions of the Arthurian myth, told largely from Merlin’s point of view, they are good books on their own. The first three books, written from the point of view of Merlin and (in the third) from that of Niniane, are, I think, more enjoyable than the fourth volume, which attempts to portray Mordred as a more sympathetic character, and the fifth and final volume, which borrows the Arthurian background of the previous four, but isn’t directly connected. There’s a hardcover omnibus edition of the first three books available from Amazon.com. These are all out of print individually at present, though here’s a hardcover omnibus edition of the first three books and there are ebook versions published as The Merlin Trilogy. The border ballad Tam Lin, Child 39 is a tale about Otherworld intruder, a fairy if you will, who takes a young man into the fairy otherworld with the goal of sacrificing him at Halloween. The young man, Tam Lin, is saved by his mortal lover, Janet. There are many versions of the ballad, and at least as many fictive re-tellings. These are some of the ones I like. Dean, Pamela. Tam Lin . New York: Tor Books, 1992. ISBN 0812544501 . Dean is an interesting writer. Don’t let the publisher’s habit of categorizing her books as “Young Adult” convince you that she’s dumbing down. This retelling of the Scots ballad Tam Lin, Child 39, is lovely. It’s a female bildungsroman, a love story, and a fantasy, set in a small liberal arts school where not all the faculty and students are what they seem. I’ve noticed that there’s a tendency for some readers to miss the subtleties of Dean’s artistry, so do read her carefully. You’ll be richly rewarded for your efforts. Don’t miss Pamela Dean’s own web site or The Annotated Dean which offers annotations to accompany Dean’s books, which are rich with allusions. Pope, Elizabeth Marie. The Perilous Gard . New York: Puffin Books, 1992. ISBN 0618150730. This young adult novel, winner of a Newberry Honor award, is set at the very end of Mary’s reign and the very beginning of Elizabeth the I’s. Pope uses history, myth, and folklore to create one of the most believable and well-thought out depictions of fairies, and another retelling of the ballad Tam Lin. Her otherworld, and its residents, is fascinating yet horrifying, both repellent and magnificent. Pope saw the dual nature of the Celtic or Faerie Otherworld and presented it beautifully and clearly. Elizabeth Marie Pope’s The Perilous Gard was my introduction to the ballad of “Tam Lin”; I love it dearly. These individual books, now hard to find, are more properly described as novelizations than translations of the four medieval Welsh tales known usually as the Mabinogion. Walton has fleshed out the characters, and added rich detail, clearly demonstrating her deep familiarity with and fondness for Celtic myth and folklore, and even Arthurian literature. The four books have just been republished in a combined edition containing Prince of Annwn, The Children of Llyr, The Song of Rhiannon, The Island of the Mighty . I believe that the Robin MacAvoy you cite above is Roberta Ann MacAvoy more commonly know as R. A. MacAvoy. She also has a novel based around the Book of Kells (and called by that name). Yep. Can’t imagine what I was thinking; thanks for pointing it out!